SALISBURY — At the old JCPenney in West End Plaza, there’s an air of celebration and anticipation. The crowd of more than 300 gathers around tables decorated with balloons and tinsel. In a small alcove seniors scribble the name of their chosen college on a whiteboard and pose for pictures. Everyone — parents, students and Rowan Crosby Scholars staff — have waited a long time for today. 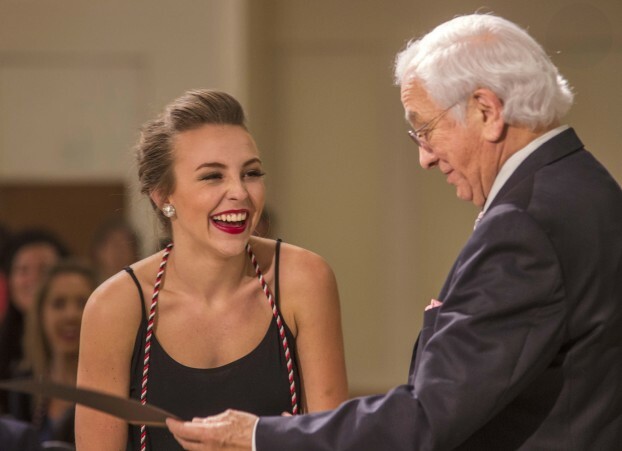 The Rowan County Crosby Scholars Community Partnership awarded 175 honor cords and more than $13,000 in scholarships at its Senior Gala on Sunday. The class of 2016 is the nonprofit’s first graduating class since it formed three years ago. “It’s just a thrill to be involved with this community-wide endeavor, the whole community has poured into this program to make it what it is today. We’re three years old and this is the culmination of the first three years,” board Chair Gwin Barr said. Rowan’s program, modeled after the Forsyth Crosby Scholars program, helps students in public middle and high schools prepare for college – or other post-secondary opportunities — academically, financially and personally. Students must maintain a 2.0 GPA, attend academies and college fairs, work with senior advisors and complete at least two hours of community service each year. Barr said that the class of 2016 completed more than 5,000 hours of logged volunteer service while in the program. “I’m so proud of them, I’m so proud of what they’ve accomplished, what they’ve achieved. . . . They had to put in a lot of effort to graduate as a Crosby scholar,” she said. Guest speakers were Brittany Orange, assistant principal at Knox Middle School, who encouraged seniors to keep a good reputation, and Dr. Philip Dubois, chancellor of the University of North Carolina at Charlotte, who gave tips for success in college and in life. In addition to the honor cords conferred upon seniors from each of the county’s seven public high schools, the organization awarded more than $13,000 in financial aid through eight scholarships. An honorary scholarship was named in honor of Paul E. Fisher, and the Executive Director’s Award was awarded in honor of Mona Lovett. Awards were given with emotion and lots of laughter as student speakers shared their dreams for the future and presenters shared their struggles to pick only one student. Executive Director Jennifer Canipe said that 35 percent of the 2016 class will be first-generation college students. Students from the Rowan Crosby Scholars program will be attending more than 40 colleges and universities across the Southeast. “You’re going to accomplish great things, and we are going to watch you,” Barr said during her welcome speech. P.E.O. Star Scholarship awarded to Ashley Mayhew. Michael McDuffie Scholarships awarded to Jordan Smith, Matthew Zucchero, Destiny White, Mallory Humphries, Calissa Andersen and Damian Campbell. The John A. Carter Memorial Scholarship awarded to Rachel Coble. The John O. Reynolds Memorial Scholarship awarded to Rebecca Malloy. The Joyce Kohfeldt Determination Award given to Alex Yang. Goodwill Willpower Scholarship awarded to Maria Delgado. The Paul E. Fisher Honorary Scholarship awarded to Megan Huffman. The Executive Director Award, in honor of Mona Lovatt, given to Jamia Angle. Top Scholars: Margaret Young, Nickolas Cox, Tiffany Vang, Julianna Evans, Mathew Washko, Andrew Eller, Claudia Patterson and Victoria Patterson.